Prominent green coloured veins and light yellow and light green interspaces. In spring the contrast is obvious. 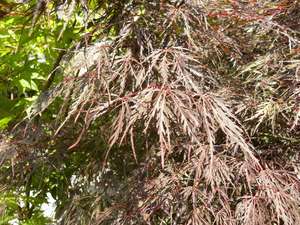 In summer the leaves turn darker green, sometimes with reddish veins. Autumn sees the foliage change to orange or rich red. Quite different to other cultivars. Each large leaf inclines to cup slightly from the leaf base, whilst the lobes radiate sharply outwards. Each leave bears seven to nine lobes which are generally ovate, tapering to a sharp point. 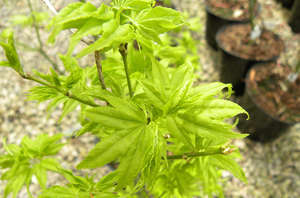 It needs protection from hot sun to avoid leaf burn. A medium sized tree reaching 5m x 4m. Great for container growing and small gardens.